Bellies, Babies ‘n More started as a branching out of the owner, Charlene Chartier’s, doula services. 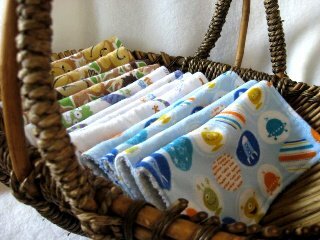 Opened in the Fall of 2007, the business has expanded to now specialize in fleece diaper covers while offering cloth diapers, cloth wipes, mama items, and pregnancy blessing jewelry. Charlene says that her goal is to “offer my clients and families around the world items that celebrate pregnancy, birth and childhood!” which is evident in the effort she puts into providing more natural products for young families to use. We recently reviewed a pair of crescent moon shorties from Bellies, Babies ‘n More. They are made of a light yellow colored fleece with a white trim around the waist. Though I still need to get some photos of these great shorties (maybe I’ll post them tomorrow if I’m really industrious tonight when I get home after working late…), we do like them. They’re surprisingly easy to pull on, and also are easy for the baby to move around in while wearing them. I think the key to this is the special circular fabric that makes up the seat, allowing for more room to move and to fit over a diaper than a traditional shorts pattern. One of the nice things about the shorties is that they can be washed in the washer and dried in the dryer. Charlene does recommend to not dry them with items that produce a lot of lint (like towels or pre-fold cloth diapers) as this will cause premature pilling of the fleece. Similar to the shorties, Bellies, Babies, ‘n More also offers fleece soakers and crescent moon yoga pants. These are very cute options, all with the same type of pattern and same materials as the shorties. 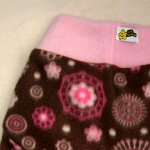 Everything that Chalene offers can be custom made and she has a huge selection of fleece prints and solids to choose from on her website. Prices are very reasonable, with soakers for $8.00, shorties for $10.00, and yoga pants for $12.00. Her biggest deal is on the wipes– 20 for $15.00! Smaller amounts are available as well. Buy it! When you place an order from Bellies, Babies, ‘n More, mention the code “LifeMoreSimply” for 10% off of your total! Win it! 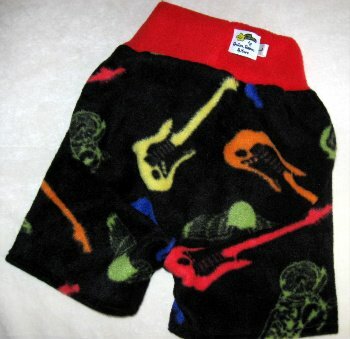 Bellies, Babies, ‘n More is offering one pair of custom made fleece shorties in your choice of color/print for FREE! To enter, visit their website and choose what print/color and size you want the shorties to be if you win. What you pick is what you’ll get. Contest will end on Aug. 11, 2009 at 1530 hours, EST. Leave an email address in your entry and a separate comment for each entry or they won’t count. I like the mice and planes fleece soaker in medium! Thanks for the chance! I would pick the medium in cute bugs, so cute! Daily tweet to spread the word! I like the Cute Bugs Crescent Moon Shorties in medium. The leaves pattern on the shorties is WONDERFUL. It would work for a girl or a boy. I like the red filagree shorties in small! I love the leaves cresecent moon shorties and I'd take a medium. I also subscribe…and my email is alexa.shelton@gmail.com.